Calling all bookworms! The long-awaited Mohammed bin Rashid Library, designed in the shape of the rehl, a book rest commonly used for placing the Holy Quran, is almost complete! Set to open later this year in Al Jadaf, the library will be home to over 4.5 million books, e-books and audio books, as well as a 500-seated auditorium and an art gallery. The Royal Atlantis Resort is a luxurious new development on Palm Jumeirah and it looks incredible! It may look like a giant game of jenga, but the hotel’s design was actually inspired by ancient civilizations and their architectural wonders. Ever partied in Beirut? If so, you’ll be glad to know that popular nightclub Sky Bar is coming to Dubai! If it’s anything like the Beirut branch, we can expect an insane line-up of artist to perform at this massive open-air venue. 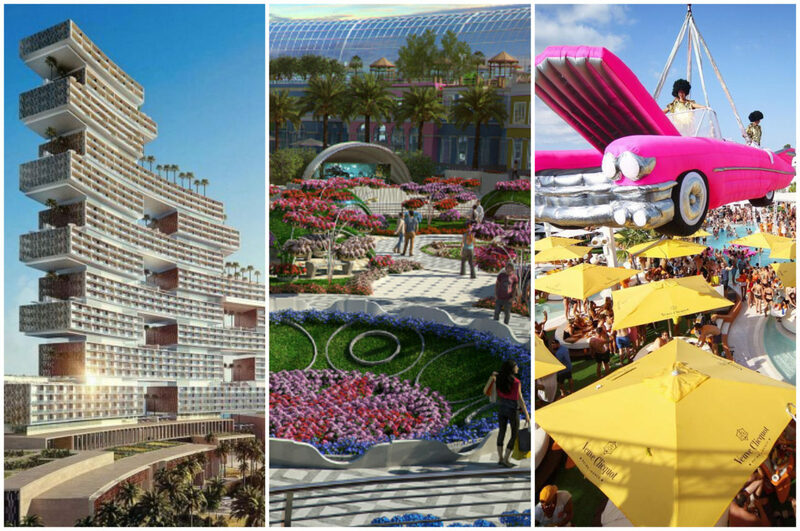 Sky 2.0 is set to open in Dubai Design District this year, opposite Base Dubai. A shopping mall inspired by nature? Yep, we cannot wait for Cityland Mall to open this year. Aside from the 350 shops, the mall will be home to the largest Carrefour in Dubai, an indoor amusement park for kids, a cinema and a 200,000 sq. ft central park! Yesss, Topgolf is finally coming to Dubai! Expected to open at Emirates Golf Club later this year, the venue will have a stunning rooftop terrace overlooking the Dubai Marina skyline. The Dubai International Film Festival was deeply missed in 2018, but fortunately for all the film buffs in the UAE, it will return this year! We cannot wait to see all the films they’ve got lined up. The world-famous Madame Tussauds wax museum is all set to open in Dubai this year! The museum, which houses wax models of celebrities from all over the world, will sit right next to the Ain Dubai on Bluewaters Island. Yep, the world-famous beach party from Ibiza is launching in Dubai next year! The exact location of O Beach hasn’t been confirmed yet, but we will let you know where as soon as we find out! It’s one of the most popular musicals in the world, and it’s coming to Dubai this year! The Phantom of the Opera will make it’s Middle East debut at the Dubai Opera this autumn.